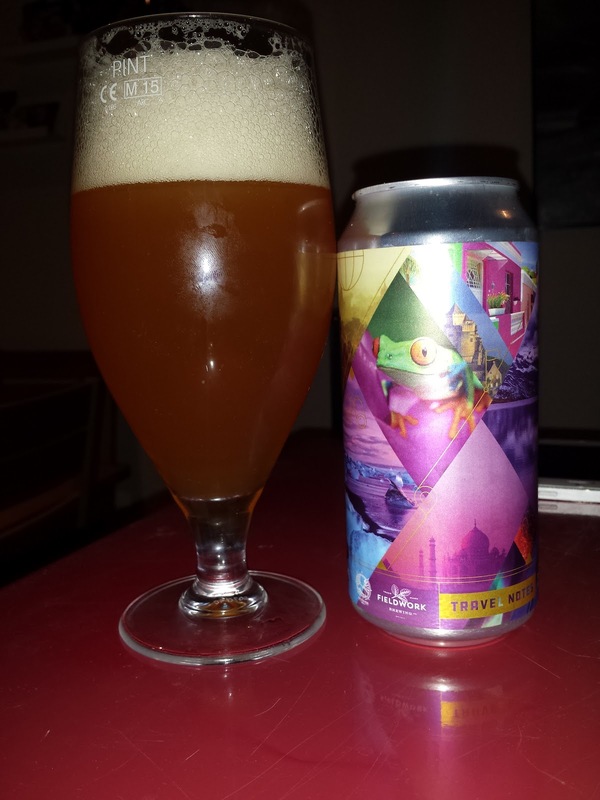 Travel Notes is a collaboration between Northern Monk in the UK and Fieldwork in the US. 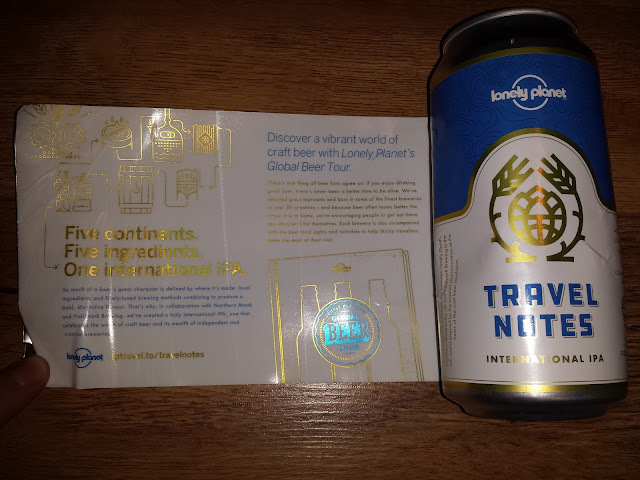 It was produced for / in collaboration with Lonely Planet. It's a 6.5% IPA with mango and acai berries. I found it very fruity and slightly tart at the same time. There's a fair bit of bitterness which I love but it's somewhat overshadowed by a sweet juiciness. I really liked it but would prefer more bitterness, less juice. While the contents of the can were interesting enough, the can itself was even more so. The artwork on the front is beautiful. In fact, it's what made me pick it up on the shelf in the first place! I then noticed a little peel here thing so I proceeded to peel off the label where I found a different can underneath and a load of information about the beer and what appears to be a lot of information about Lonely Planet, also known as advertising. It's worth noting that the can as it appears underneath the colourful label is not something that would catch my eye so it's a good thing they covered it up. 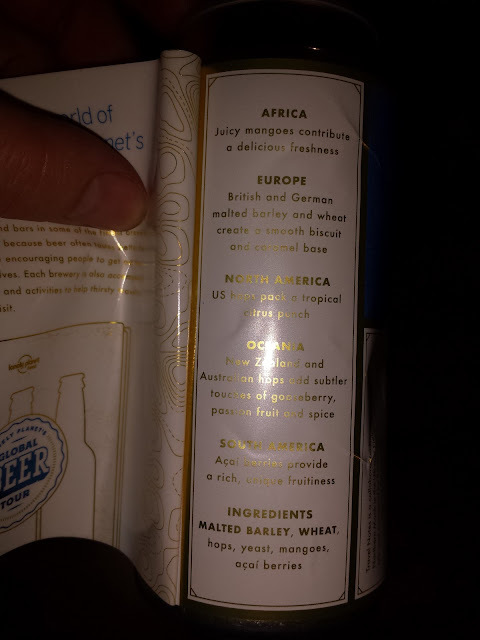 Peeling a bit more, I discovered how they used ingredients from the 5 main continents in the beer. Mango from Africa, European barley, North American and Oceania hops and then African acai berries. All in all, the beer was tasty if a little overly juicy for my taste and the can made for interesting reading and will certainly suit the destructive type who likes pulling things apart or tearing up beer mats in pubs. Closer to home, Sullivan's in Kilkenny sent me a bottle of their collaboration with the Hellfire Brew Club in Dublin. 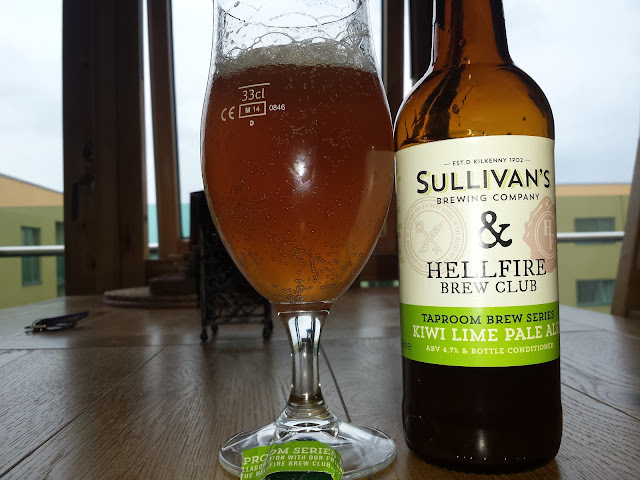 This one is a small batch from their onsite pilot brewery in Kilkenny. It's a Kiwi Lime Pale Ale. This is a beer that deserves to be scaled up and made available on draught. I demand that this is so! There's a little tartness from the lime and some other hints of citrus but there's a long, pervasive bitterness. It's bottle conditioned so in the style of a wheat beer, I first poured it carefully to keep the yeast in the bottle and then tried it again after swirling the yeast and pouring it into the beer. I thought it worked better with the yeast. It's very refreshing and I loved it because it's not a juice bomb like all the new pale ales these days. By the way, if your'e a foreign reader and are not aware of the Hellfire Club, it's a Dublin treasure. Google it! Right now it's completely open but they are planning on putting a visitor centre there which will formalise it and some might say, take away from the whole thing. The Tale Of The Ale: Collaborations Worth Travelling For?